Metal maniacs, rejoice! The Thrasher returns to present to you: UNLEASH THE ARCHERS; signed via Napalm Records, hailing from Canadian grounds - performing Power/Melodic Death Metal, on their 4th album entitled “Apex” (released June 2nd, 2017). Since formation in 2007; the quintet in question have 3 albums behind them, I'm introduced to their 4th record entitled “Apex”. 10 crushing tracks; ranging at around 1:00:37, the quartet's newest deliverance constructs a very distinct formula of Power Metal/Death Metal mechanics. From opening track “Awakening”, Brittney Slayes on vocals is the most notable conception – there is an unmistakable imitation going on of KOBRA AND THE LOTUS' Kobra Paige's clean vocal patterns that resembles UNLEASH THE ARCHERS' front woman ingeniously well, both quartet's being completely different however – the aforementioned vocalist has a more broader characteristic, and that is savagely brutal guttural growls that, for a female is delightfully unprecedented, no? The fused sub-genres is pleasantly welcoming, as this prodigious sound production demonstrates an original and memorable songwriting process of grandiose results. “Shadow Guide” is the next in line; showcasing powerhouse drummer: Scott Bachanan's proficiently constructive slams and monstrously rhythmic distinction for that enlightening sense of stimulation as the groove pounds into oblivion, the instrumentation is pummelling as is the musicianship's fulfilling expertise. “The Matriarch” continues the groovy elegance of Nikko Whitworth's pulverizing bass adroitness, forming a solid slab of stunning dominance. “Cleanse The Bloodline” distributes more similar attributions that have an abundant of influential elements that stem from gritty ARCH ENEMY melodics to DRAGONFORCE-like power metal grooves; sweeping guitar leads and heart-pounding supremacy from the complex, dextrous duo from Grant Truesdell & Andrew Saunders on guitars. Formulating dynamic arrangements that excel with thunderous alternatives, “The Coward's Way” sees more evolving exhibitions with magnificent solo finesse & more of those growling snarls & intense high-pitched screams. There is a lot in terms of diversity on this disc if you're looking for unparalleled achievements, “False Walls” is the next in line – including divinity, beefy chugs, prolific drumming & ballad-like complexion. UNLEASH THE ARCHERS progressively organizes in uncompromising organics, while having an unique aesthetic in which are both hard-hitting and elegant in substance. We then have the mighty “Ten Thousand Against One” which sufficiently manifests with hooking, neck-breaking proficiencies which proves to be the record's most significantly vigorous performance yet, not that the other songs aren't…just in terms of fist-pumping ascendancy. “Earth And Ashes” introduces Andrew Kingsley on vocals as a duet, adding more exquisite variety to this already flamboyant release…adding more harmonic prominence to boot. “Call Me Immortal” ensues more passion and an opening riff that has a slight IRON MAIDEN tonality to it from “Killers” & “Number Of The Beast” era, and leaps into a more epic - savagely sounding, and unfamiliar enjoyments. Even in this portion, there is still monumental amount of technical material here that is considered worth listening to at least once. Each member splendidly perform with grace, and ambitiously supply a satisfactory amount of exceptional songwriting skills and prowess. Concluding “Apex” with the titular track, I am overall compelled to say that UNLEASH THE ARCHERS have distributed a divine piece of Metal integrity. The finishing track has a more has an innovative opening to it, flourishing with a nice harmonic pattern that perfectly ends the record as how it should end - still including a salubrious amount of hostility and sentimental divinity. If this is your first discovery to the band then congratulations; I believe this revelation will be a most majestically malicious listen for you. Looking for a slice of vintage coherence? 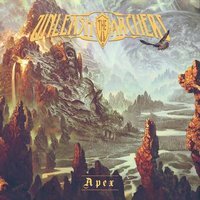 Look no further, UNLEASH THE ARCHERS has you covered with “Apex”.